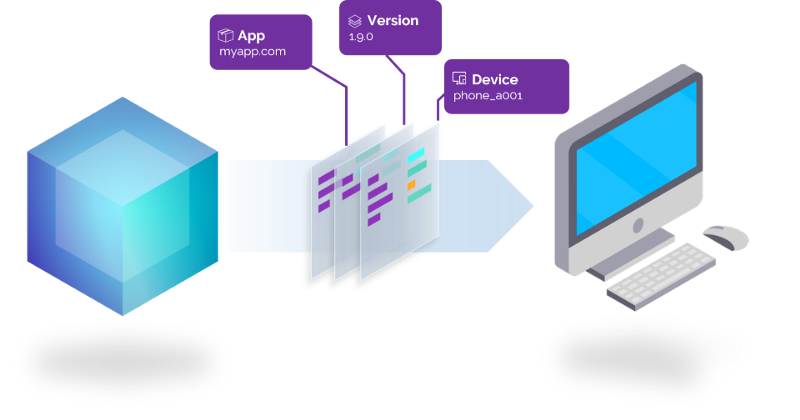 How centralizing your App-Configuration helps you to respond to unexpected events. Your business relies on making new features available to your customers quickly and regularly? This means that you are probably one of the many teams that use Agile development methods. Whether an app, web service or IoT application is deployed, these development methods often require a configuration to be adjusted after an application has been deployed. If your application is in your hands, this is not always a problem. But what do you do when your application is in the hands of your customers? Simply accessing configuration files is not possible — especially with a mobile app. To counter this problem, there is, among other things, the way to outsource the configurations to a central location. With this solution you have the possibility to adjust parameters from a central point or to switch off single functionalities. In the event of an unexpectedly immature function, you can deactivate it in a matter of minutes without being able to deliver another version. One tool that offers exactly this solution is Congether. This product is an application management platform that supports both configuration management and application monitoring. These tools can be used either via public APIs or via corresponding open source SDKs. Congether can be installed as Docker-Image or manually for Linux and Windows. Your applications are managed via a web interface. In this interface you can make various adjustments. For example, which hierarchy levels are available. This means that you can not only configure your application, but also fine-tune it for specific versions, devices or even individual installations. For example, if you are developing a .NET or Angular application, you can use the open source SDKs available via NPM or NuGet. For all other platforms, you can use the public API, which is described in detail on the documentation website. 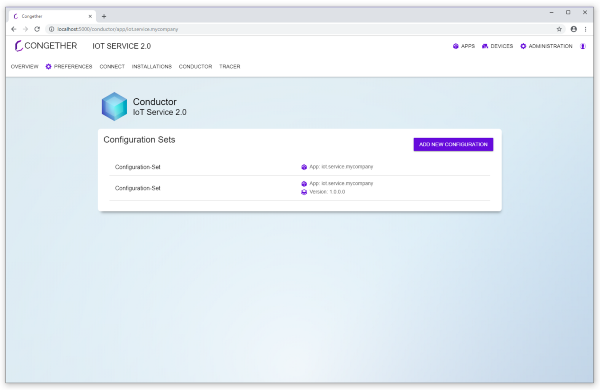 Once you have created your application in the Congether administration interface, you can use the Conductor module to create configuration sets. These configuration sets are assigned either to the application, its version, a device or an installation. In these configuration sets, you can now use key-value pairs to store the application parameters that you want to use in your app later. These can either be completely new configuration parameters, or simply those that you already use in the local configuration files. Each assignment of a configuration set defines the order in which it can be overwritten or overloaded. Thus, each endpoint contains its individual application configuration. So if an endpoint of your Application A with Version 1.0requests a configuration, the configuration sets of application A are combined with those of Application A/Version 1.0. This is exactly how it happens when an application also transmits device names or installation IDs. You can use these identifiers to customize parameters from anywhere, right down to individual installations. This allows you to offer your users real added value by not having to publish completely new updates for simple parameter changes. On the other hand, you can quickly change the behavior of applications in large projects without having to adapt a line of code or even have physical access to the configuration files. 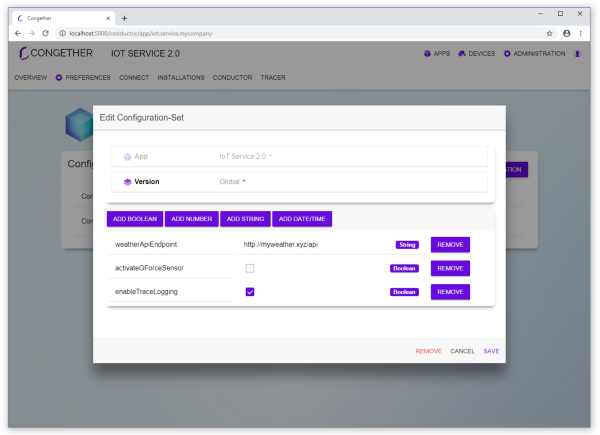 With Congether, you not only manage to make central changes to the application configuration, but also to solve problems with a feature or, for example, a service endpoint within a short period of time. For you, this means more positive user feedback and fewer releases, which also means less work for your customers. Find more about Congether on https://congether.com/. Thank your attention. More interesting ideas, articles and solutions about helping you to build great software-products you can find on our website, or feel free to follow us on Facebook and Twitter.